You have not tasted okpa until you taste ‘okpa ndi Enugu’ (Enugu okpa). 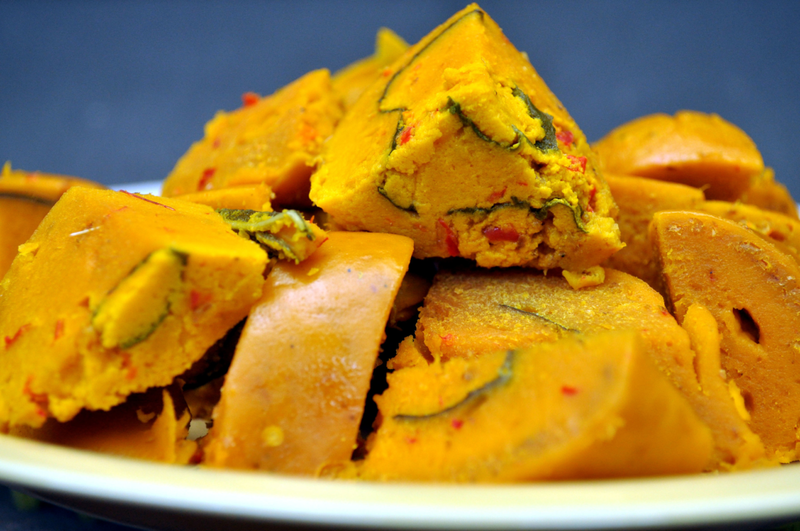 Okpa is best prepared using a few ingredients because the beans –Bambara beans- has its own peculiar taste. Depending on preference, you can make okpa with fresh pepper and uziza leaf. The leaves are preferable because it gives a certain taste to the okpa. Others might decline because the colour of the leaves sips into the okpa, which reduces the yellowish colour. However, you can use both nylon and leaves, that way, you do not lose the leaves taste and you can retain the colour. Sieve the okpa flour into a big bowl, add your grounded crayfish, salt, smashed seasoning cubes and mix. Pour the oil into the mixture and mould with your hands until you achieve unity in colour, yellow. Boil the water in a pot . It should not be steaming hot but rather lukewarm. Slowly pour the water into the mixture while you knead. The quantity of water depends on how you want the end result to be. If very soft, add a generous amount, if on the fence of soft and hard, act accordingly. Add the blended pepper and sliced uziza into the mixture and use a turning stick to stir not hands. Set aside when ready. Boil water in a pot. Ensure that the water is enough for the wrapped okpa to be completely soaked. Wash the leaves and nylon thoroughly. Wrap the okpa into sizes of your choice and place in the pot of steaming water. Allow boiling for at least an hour and serve hot.